In June of this year I was fortunate to be invited on a trip to Dusky Sound, one of New Zealand’s wilder and more remote places – a place of historic richness and profound contrasts. Our task was to lay out a line of stoat traps around the coast of Long Island, which lies close to the mainland and provides a stepping stone for stoats and rats, assisting their attempts to re-invade the now largely predator-free Resolution Island. The contrasts of this place became apparent almost from the outset of the trip – we traveled by boat, leaving the calm anchorage at the head of Doubtful Sound in the late afternoon, reaching the outer coast at nightfall to travel south to an overnight anchorage in Breaksea Sound. While the enveloping darkness hid the heaving state of the sea on that open coast, its contrast with the sheltered waters of the fiords were readily apparent, and I was able to photograph some of those differences over the next few days. 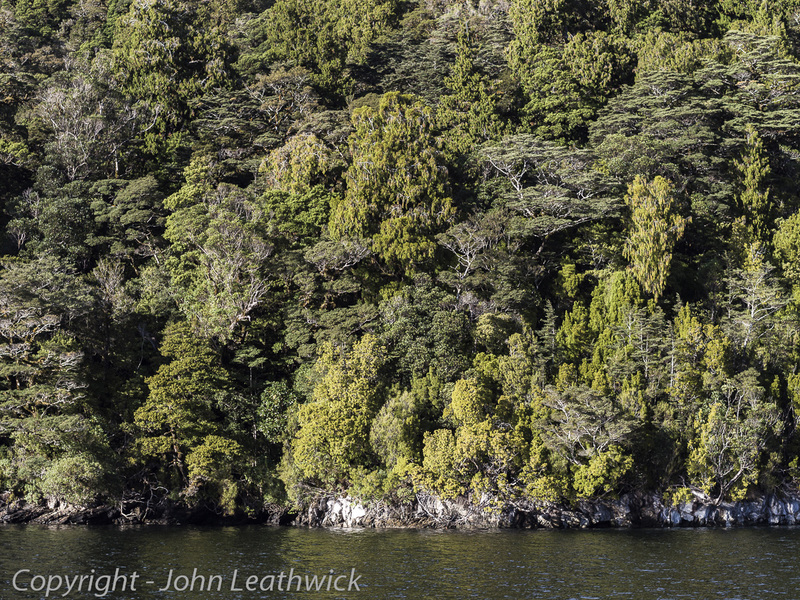 The most graphic of these is the extent to which forest extends right down to the high tide line on the sheltered coasts within the fiords – in some places, the trunks of southern rata trees dipped into the water. By contrast, the forest on the outer coast is almost constantly battered by a wild mix of wind and salt, which in many places reduces it to a twisted low scrub. 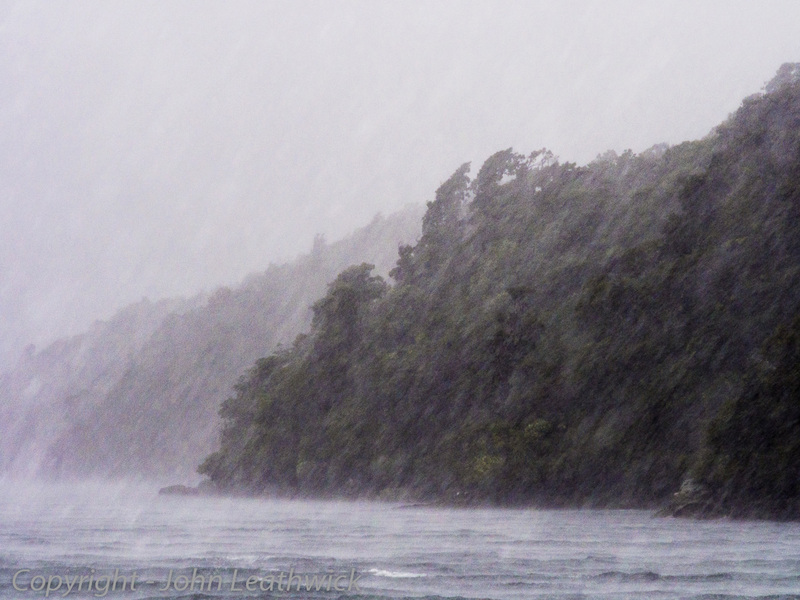 Weather was the second contrast – the Fiordland weather is legendary, and its intensity can be breathtaking, however prepared one is for the encounter. In four days we experienced the full gamut – calm with cloudless skies and bright sun, moody low cloud with occasional drizzle, gale force winds with torrential driving rain, and bright sun with gale force southeasterly winds. This a place where the weather is in your face – and the speed with which it transforms from one state to the next can be gob-smacking. The last contrast lies in the historic dimension – this is a place of profound historic import for New Zealand, and for New Zealand conservation in particular. It is one of the key sites for Cook’s European exploration of New Zealand and his early interactions with Maori – in this case most likely a group of Ngati-Mamoe refugees whom he encountered in 1773. Cook and his crew stayed here for over a month, clearing forest at Astronomers Point to facilitate accurate fixing of their position, charting the various islands and passages, and collecting and documenting the flora and fauna. However, while the physical layout and environment of Dusky Sound probably remains much as Cook experienced it, the natural environment he encountered has been profoundly altered through the introduction of alien predators such as mice, ship rats and stoats, and browsers such as possums and red deer. The new predators arrived here first, bringing havoc to naive and flightless native bird species such as the kiwi and kakapo. In the 1890s, with remarkable foresight, Richard Henry began arguably the first program of island transfers of New Zealand’s native bird species after observing the depredations of introduced rats. One can only imagine his despair at seeing his efforts undone once stoats arrived to intensify the onslaught on his beloved native birds. Today that work continues, reflecting the sad reality that we humans have brought profound and far-reaching changes to the native inhabitants of this land. And if we wish our children to continue to see species such as kiwi, kaka and kakapo, then our continued intervention is not an optional extra. Many of these species depend on our efforts for their survival, and left to their own devices they are doomed to the black void of extinction. That might seem a heavy and expensive load for us to carry – perhaps its just fitting justice visited upon us for our folly in failing to see the links between our actions and the future state of the fragile world that we inhabit. Keeping camera gear dry in an environment like this is challenging – I took my OM-D and four lenses (12, 17, 25 and 45 mm primes) in a Kata DC435 case that just fits into a heavy plastic dry bag with a folding top. This has a convenient carry handle that was easy to hold in one hand when getting on and off the small inflatable boats that we used to go ashore around the coast – I could be confident that if dropped my bag would float and my gear would remain dry. I also took a Nikkor 135 2.8 AIS, which on the Olympus turns into a 300 mm equivalent and with its fast 2.8 max aperture, it performs impressively as a manual focus tele. I used this for photographing birds off our main boat (a 22 m ex cray boat) and for the occasional landscape, particularly when motoring back up the coast on the last day. Around the sheltered coast, I mostly used the Olympus 17 mm 1.8 that I’ve recently bought – I love its angle of view and its relative placement of near and far objects, and its fast focusing and resistance to flare are also impressive. Some reviews have complained of its lack of sharpness, but for real world photography (as opposed to pixel peeping) I find it a fine performer. Images from this trip can be found here.